The name is taken from the Gaelic meaning Majestic Residence. The car park is to the left after turning off by Crathie Kirk and a short walk takes you to the office where entry tickets can be bought on the day along with a guidebook. A train pulled by a land rover takes you up the large driveway to the tourist attractions of this Highland retreat. Visitors can enjoy looking round the Ballroom which has been filled with items of interest such as ballgowns worn by Her Majesty Queen Elizabeth the Second and the late Queen Mother during state visits. There is an exhibition of photos of the wildlife and landscapes of nearby Cairngorms National Park. Please note that cameras or recording devices are not permitted to be used, though can be used throughout the exterior. An audio tour is available, in different languages, for a refundable deposit of �5. We recommend taking headphones to make listening more comfortable and easier as you make your way around the water gardens, flower and vegetable plots, lawns and summer cottages, water garden and have a go on the large wooden swing used by a young Prince Charles. This is also downloadable as a free app. Disabled visitors with a blue badge can drive through the gates and up to the buildings. By this disabled car park are electric wheel chairs which can be used for free to get around the grounds and gardens. At the rear of the buildings is a ramped access to the Ballroom exhibition and others displays in the stables are accessible without stairs. These house carriages and old vehicles, information and photographs about the Royal Yacht Britannia. One room contains every official Christmas card sent by Her Majesty since her reign. Dogs are permitted around the grounds so long as they are kept on a leash. The image above shows the deer larder where they were stored and prepared after shooting events. More active tourists can enjoy the marked walks and trails which lead to Royal Deeside and give some stunning views of the Scotland countryside. Parts of the estate can also be viewed in a luxury Land Rover Safari which are driven by the guides. The gift shop sells items such as unique gifts from the Collection. 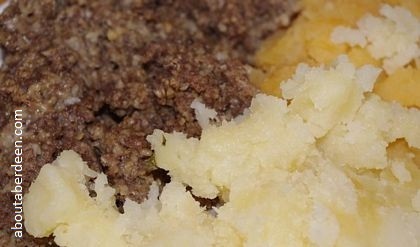 There is a coffee shop open for visitors and we particularly enjoyed the haggis, neeps and tatties following by a scone with cream and jam. Toilets are available in this building. The opening times are from 10am until 5pm with a last admission time of 4:30pm. It is open from the months of April to July and there are guided tours in November which are advertised at their website. 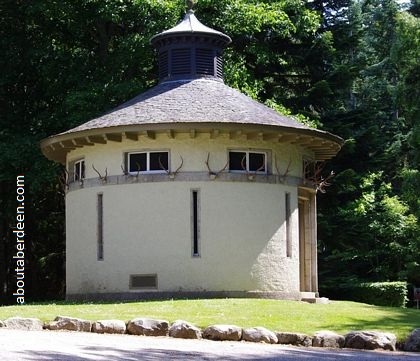 Prices for a visit is �10 for an adult, �9 for OAPs and �5 for children. A family ticket for 2 adults and up to 4 children is �27-50. There are discounts for groups. 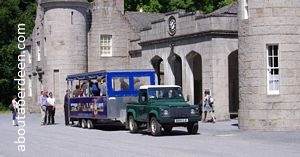 Guided tours are available but pre booking is essential and there is an additional cost. Disabled visitors can park within the grounds but drivers will need to visit the ticket office first to arrange parking. There are free disabled buggies and wheelchairs available to use courtesy of Smart Mobility and entrances are ramped. There are also disabled toilets and an audio loop system for the audio tour for the hard of hearing. There are a variety holidays available ranging from residential painting holidays, walking holidays at nearby Loch Muick and Dubh Loch and photography holidays. Accommodation is in the staff accommodation and catering is provided for these residential courses. The walks are led by Alan Melrose who is a local trekker and has led expeditions to the Himalayas, Mongolia, Mount Kilimanjaro and the Andes. Nature lovers can get rare sightings of flocks of snow buntings, red deer and golden eagles. A new holiday introduced is the Wildlife Watch Holiday This accommodation includes the Queen�s Buildings which she uses for overspill guests when she is in residence. Prices include catering using the freshest of local ingredients. Other holidays include renting self catering cottages within the Balmoral Estate. The Royal Family have owned it for over 150 years. It was purchased by Prince Albert for his wife Queen Victoria in the year 1852 though they had leased it since 1848. Their first visit to the Highlands of Scotland was in 1842 and since then they actively looked for a Scottish retreat. Prior owners were the Drummonds, Farquharsons and the Gordons (cited in Castles of the Clans: The Strongholds and Seats of 750 Scottish Families and Clans by Martin Coventry). The original building was considered too small for their needs and a new one was constructed soon after their purchase using Granite stone from the quarry Glen Gelder. 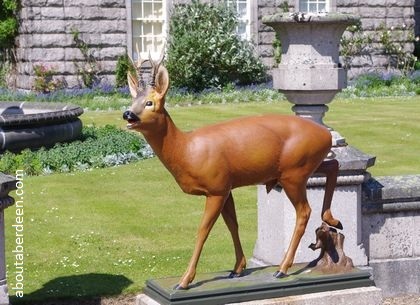 This started a new era in the Balmoral Castle history. The architect was William Smith of Aberdeen and the second was built about 100 yards from the original so that the Royal Family and their servants had somewhere to stay during the building work. Queen Victoria laid the foundation stone on the 28 September 1853. Into a bottle was placed a signed parchment with the date was placed in a cavity beneath the foundation stone along with several current coins of the realm. Building work was completed in 1856 and the original was demolished. A commemorative stone on the front lawn marks where the front door of the first would have stood. Queen Victoria often called it her paradise in the Highlands. Since her death it has passed onto each British Monarch which have been King Edward VII of the House of Saxe-Coburg-Gotha and from the House of Windsor: King George V, King Edward VIII, King George VI and Queen Elizabeth II. It's a Long Way to Tipperary: British and Irish Nurses in the Great War by Yvonne McEwen tells of the King giving the use over to the War Office during the First World War. It was used as a hospital for the treatment of wounded soldiers and sailors. During the Second World War Princess Elizabeth and Princess Margaret were here for the first four months. They then spent the remainder of WWII at Windsor Castle, England. During their time here they became members of the Girl Guides at the Village Hall. Their tutor was called Marion Crawford whose nickname was Crawfie. Together they would attend nearby Crathie Church and because the service was at 11:30am they missed the radio broadcast by Neville Chamberlain that Britain was at war. The Minister at the time was Dr Lamb. He ended the service with the words ...and now we are at war. The Princesses and Marion Crawford would shop in nearby Aberdeen in stores such as Aberdeen Woolworths. The Princesses returned to Buckingham Palace on the 20 December and then went to Sandringham three days later. In May 1940 they moved to Windsor until 1945 when World War Two ended. United States of America President Eisenhower stayed here in August 1959 as a guest. It remains a favourite retreat for the Royals including Her Majesty and Prince Philip, Prince Charles and Camilla Prince William and his friends. They often fly into nearby Aberdeen airport at Dyce and visit Crathie Church for services. They start their annual stay at the end of July or the beginning of August. They usually stay for about ten weeks. It is affectionally nicknamed The Big Rest. Whilst it is being prepared by the staff, Her Majesty stays at nearby Craigowan Lodge. Public events include open air theatre performances, concerts, the Road Race and falconry displays. On Sunday 13 September 2009 BBC4 broadcast a documentary about life there. In June 2007 a rare Tsar Nicholas II signed photograph went up for auction. The last emperor of Russia had signed a photo of himself whilst here and by his signature he wrote the words Balmoral 1896. He had been staying during a ten day visit to Scotland with his wife Alix. Her grandmother was Queen Victoria and the visit was made 18 months after their marriage and just before her Diamond Jubilee. It was expected to sell for about �2500 at the Christie auction at the Rockefeller Plaza New York, America. Over 100 other celebrity and famous photographs and signatures were sold during the auction at an estimated �500,000. It was only the sixth signed picture of Tsar Nicholas II to have been sold at auction in the last 30 years and the final purchase price bid was �6,666. In June 2008 the annual Devoted To Life walk with the Marie Curie cancer care charity took place in the grounds. Over �15,000 was raised which beat the 2007 figure of �9,000 thanks to the location. It is held in a different location each year. Permission was given to hold it in the grounds because the Marie Curie charity was celebrating its diamond anniversary. The Royal wedding of Prince William and Kate Middleton on 29 April 2011 was celebrated here with special food for visitors. Large screens in the grounds and within the visitor attractions broadcasted the event live. 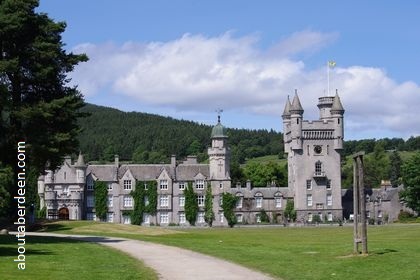 Below are details of Balmoral Castle Ghosts and supernatural activity. In The Guide to Mysterious Aberdeenshire Geoff Holder describes the day Queen Victoria died on 22 January 1901. The bell of Crathie Church tolled and the flag at the tower was raised to half mast. Heavy snow had stopped the tower clock at 6:30pm. This was the time of her death. Combined tickets to here and the Royal Lochnagar Distillery Tour can be purchased.